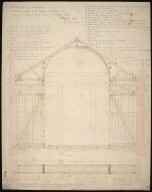 On 2 Nov 2015, the CRC hosted a seminar which looked at the figure of William Henry Playfair (1790-1857), discussing his life and work and looking in some detail at a range of architectural drawings which had been selected from our collection. Playfair was born was born in Russell Square, London, July 1789. On the death of his father, architect James Playfair, he was sent to reside with his uncle in Edinburgh. Professor John Playfair, mathematician and geologist and a leading figure in the Edinburgh Enlightenment, took control of his nephew’s education. Following his father’s profession, the young Playfair studied under William Starke of Glasgow. Following Starke’s death in 1813, Playfair moved to London where he worked in the offices of James Wyatt and Robert Smirke, returning to Edinburgh in 1816. Hill estate; the unfinished National Monument on Calton Hill; and, the Royal Scottish Academy and the National Gallery on the Mound. While Playfair’s most important works in Edinburgh have been executed in the Greek revivalist or classical style – earning for Edinburgh the title of ‘Athens of the North’ – he was competent in other styles too. He designed New College for the ten newly established Free Church of Scotland, a jagged-lined rendering of the Gothic style. He also built country houses and mansions in the Italianate and Tudor styles. The discussion in the seminar was not structured in any major way but flowed directly from looking at the drawings we had selected to view. 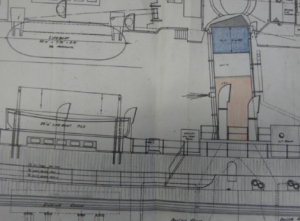 Alongside the physical drawings, we also looked at digitised ones, using the complement of both to do things which one or other could not do alone. This entry was posted in Collections on 09/11/2015 by Grant Buttars. 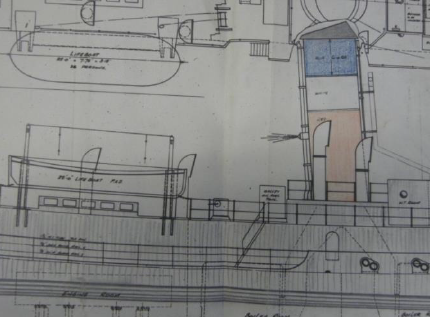 Plans for converting former naval vessels into whale-catchers – an item in the Salvesen Archive. This past weekend – Saturday 31 October – saw Dr. Graeme D. Eddie of the Centre for Research Collections (CRC) participate in the Penguin City Meeting of the South Georgia Association (SGA), held at the Budongo Lecture Theatre, Edinburgh Zoo. The SGA is a non-profit organisation formed to give voice to those who care for South Georgia, a remote mountainous island in the South Atlantic. The SGA meeting had been organised and chaired by Dr. Bruce F. Mair, geologist. Also present among the geologists, glaciologists, botanists, ecologists, and former whalers, were Alexandra Shackleton, granddaughter of Sir Ernest Shackleton (1874-1922) and current President of the James Caird Society, descendants of Carl Anton Larsen (1860-1924) the Norwegian-British Antarctic explorer, and descendants of Sir James Mann Wordie (1889-1962) the Scottish Polar explorer and geologist. 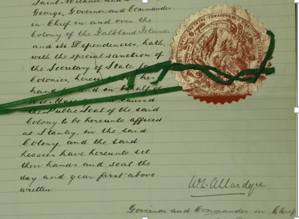 Signature of William Lamond Allardyce, Governor and Commander in Chief of the Falkland Islands, together with Seal, on the Lease agreed with the South Georgia Co., a firm raised by Christian Salvesen & Co. in 1909… an item in the Salvesen Archive. Presentations on the day covered ‘Accessible Archives and the Industrial Past’, ‘Science and Field Work’ and ‘South Georgia 2015 and Beyond’ and, represented as an accessible archive, the CRC presentation was given in the first section of the Meeting. 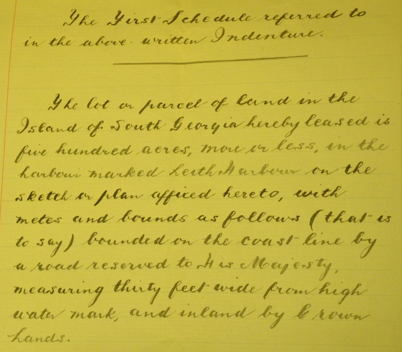 The Lease indicated that ‘five hundred acres, more or less, in the harbour marked Leith Harbour’, South Georgia, was to be allocated to the firm. The Lease permitted the firm to operate two whale-catcher vessels in addition to two associated with a Lease over Allardyce Harbour. Four vessels in the region made the whaling operation viable. 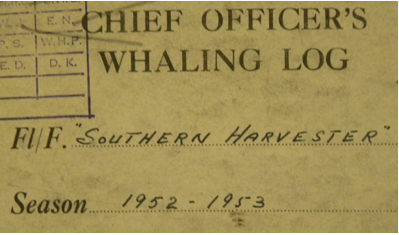 Profiling the Salvesen Archive, it offered a brief history of the firm of Christian Salvesen & Co. Ltd., and a look at the transfer in three stages of the archive of the company’s whaling business to Edinburgh University Library starting in 1969. Cover of the ‘Whaling Log’ of the Salvesen & Co. whale factory-ship, ‘Southern Harvester’, season 1952-1953… an item in the Salvesen Archive. 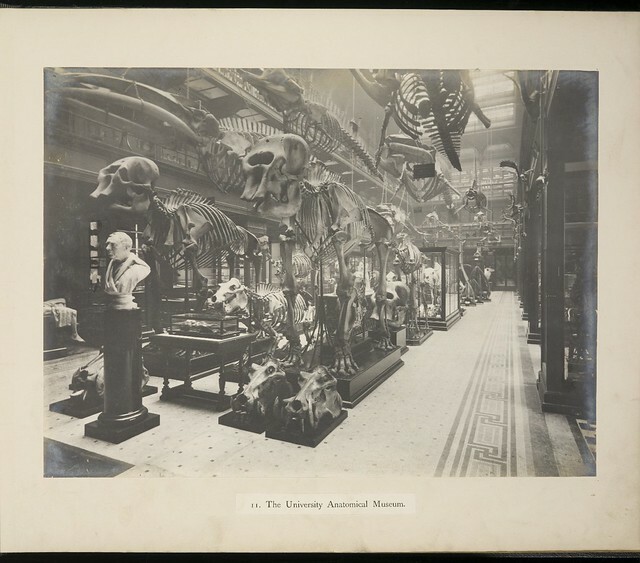 The content of the Salvesen Archive was described with illustrations showing its variety. 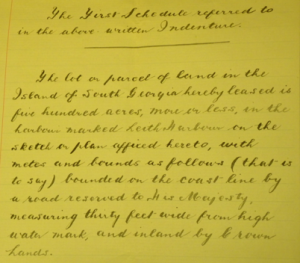 The talk looked at some of the conservation needs of the material, the use of the collection by researchers, and offered glimpses of the lives of personnel at the South Georgia stations. 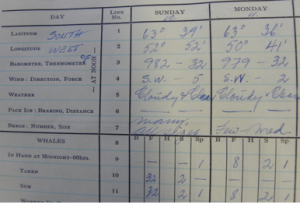 While the ‘Whaling log’ has provided data of whales caught and processed to researchers of the past, it also provides climatological information to weather scientists and researchers today, giving information about ice, wind, and temperatures. The transport of live penguins by the company to Europe – not least to Edinburgh Zoo – was also briefly explored through images from the Salvesen Archive. A slide from the presentation at the SGA Meeting. The SGA meeting also saw presentations from the National Library of Scotland with the title ‘South Georgia on the Shelf’ and looking at the Map and Wordie collections, and from the South Georgia Heritage Trust & the National Museums of Scotland about a project to highlight the location of South Georgia related objects around the world. John Alexander who had spent winter seasons in the whaling industry gave a talk on ‘Sailing in the Antarctic with Salvesen’. A slide from the presentation given at the SGA Meeting. There were also presentations on tussock grass on South Georgia, the geology of the island, sustainable South Georgia fisheries management, and the rat eradication programme. The day was concluded with a visit to the penguin enclosure at Edinburgh Zoo. 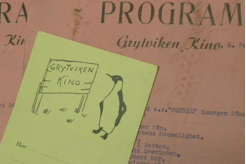 ‘Membership card’ for the Grytviken Kino… the cinema at the Grytviken whaling station, South Georgia. At the time – up to the early 1960s – it was the most southerly cinema in the world after the cinema in Ushaia, Tierra del Fuego. 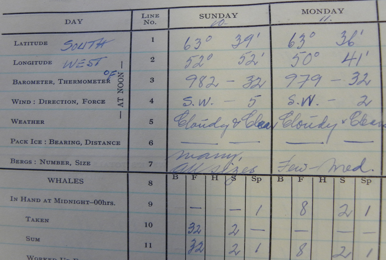 The host for SGA Meeting, Dr. Bruce F. Mair had been a geologist with the British Antarctic Survey and had carried out extensive mapping in an area of South Georgia around Brandt Cove, Larsen Harbour and Drygalski Fjord in the 1974-75 and 1976-77 field seasons. The region’s Mt. Mair is named after him! 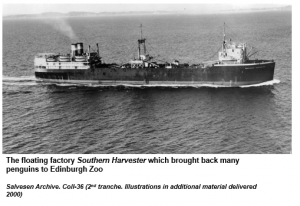 This entry was posted in Collections and tagged Christian Salvesen & Co. Ltd., Salvesen & Co., Salvesen Archive on 02/11/2015 by eddiegd.